Shrill carder bumblebee (Bombus sylvarum). Photo credit: Ray Reeves. Other than the extinct and re-introduced Short-haired bumblebee (Bombus subterraneus), this is perhaps our rarest bumblebee, now known only from a handful of sites in south Wales and southern England and generally scarce even there. It has a strong association with complex flowers in the families Lamiacaea and Fabacaea and is a distinctive greyish-green, straw-coloured species, with a dull orange tail and clear black band across the thorax. Shrill carder bumblebees. Photo credit: David and Holly Harries (left), Dave Watson (right). 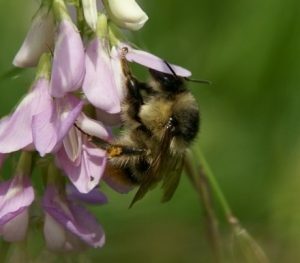 View our Shrill Carder bee factsheet here. The Great yellow bumblebee (Bombus distinguendus), now only resident in northern Scotland, and Field cuckoo bumblebee (Bombus campestris) both have a similar black thoracic stripe, and worn and faded workers of the ginger carder bumblebees (Common carder bee, Bombus pascuorum; Moss carder bee, Bombus muscorum; and Brown-banded carder bee, Bombus humilis) can look similar, yet none of these have the orange tail of the Shrill carder bee. Males have a similar banding pattern to that of the Red-shanked carder bumblebee (Bombus ruderarius), but the yellow bands of the Red-shanked carder are much darker, almost blending with the black background (obviously straw-coloured in the Shrill carder), and the red tail of the Red-shanked carder is a much brighter red than the washed-out orange of the Shrill carder bumblebee. The male genital capsule is useful to check the ID, particularly of worn specimens.